Just had the most fun, thrilling, exciting experience of my life.... just got back from the ART STORE!!! (Ok, so maybe I am exaggerating a little bit). It's so interesting how we are wired. The things God instilled in us that really make us tick. What are yours? Part of the reason I started the cards at Lisscat Creations was to inspire people. 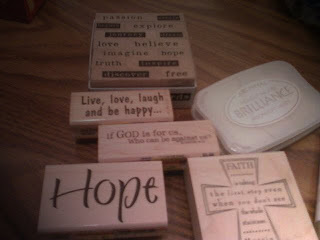 The stamps I just got at the art store (which were also on clearance by the way) are all about words of encouragement, passion, excitement, and all the other way's God shows his loving existence to us over and over again. So...I leave you with this... What are you passions, the things that make you YOU? Go re-discover them, and spend a little time letting yourself have some pure fun. After all play time, isnt just for kids! Till next week, stay BLESSED!